If you have faith, family and friends then you are bound to have a full life. 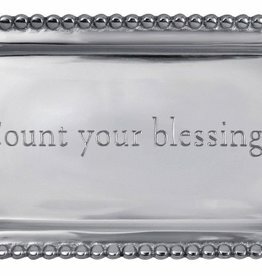 Remind yourself to be thankful with this poignant and spiritual, engraved tray. 100% recycled materials. Made by hand. Easy care with soap and water, towel dry. This modern Pearled Octagonal Statement Tray is a great catchall for dressers or desktops. Handcrafted from 100% recycled aluminum. Add a modern touch and personalize it with a favorite statement or monogram. The fine metal is handcrafted from 100% recycled aluminum. 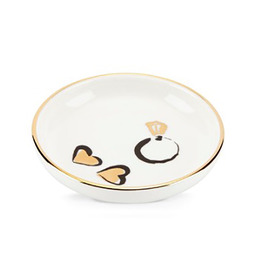 Fun and fashionable, that's our 14 inch square Beach Cruiser Libby Lacquer Serving Tray! We've splashed a cream-colored beach cruiser bike pattern onto a fresh pink background for a current and timeless look. A celebratory gift becomes unique when it carries a thoughtful message. From simple and chic to endearing and formal, our Expressions themes and artistry let your lucky recipients celebrate their unique worlds, while never forgetting how much you care. A great gift for that cabin, farm, or rustic home. Fall and holiday tables, especially. 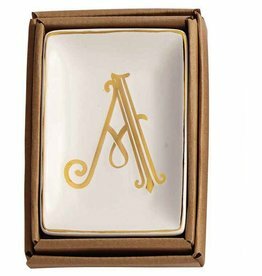 Small stoneware tray features gold rim and center initial. Arrives in kraft gift box. A, B, C, D, E, F, G, H, J, K, L, M, N, P, R, S, T and W avaliable. Specify which letter you need in the comments field during checkout. 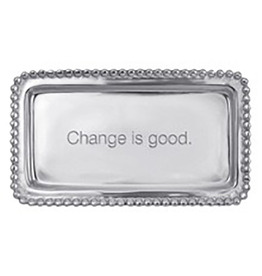 Enamel dish of recycled aluminum adds beauty to her table. Perfect for sauces or nuts. Created by hand sand casting from recycled aluminum. Hand wash with mild detergent to retain no-polish finish. Be inspired and get motivated with our "Work Hard. Play Harder." Statement Tray. Statement Tray - Work Hard. Play Harder. Express your thanks with the "thank you" Tray. Top the tray with a folded, handwritten note, and pass along your gratitude to supportive friends or family in an extra-special way. What a sweet message for the holidays to last the year long. Created by hand sand casting from recycled aluminum. Hand wash with mild detergent to retain no-polish finish. 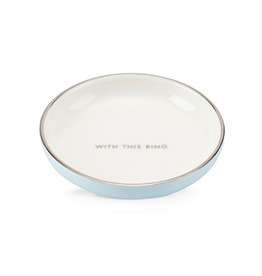 This tray makes a great graduation or engagement gift. 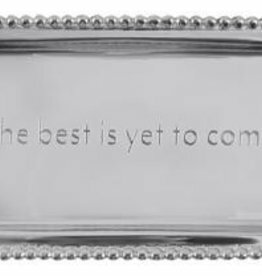 Pair this hopeful sentiment with a check?trays are perfectly sized to fit one and they come beautifully gift boxed for easy gifting. The "Change is good." Tray is a perfect catchall for loose, pocket change. Or a great gift for someone making a big change in their life. Never has a sentiment been so true..."Love is all you need." 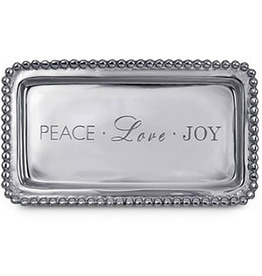 Give this handcrafted, engraved tray as a gift to those you love and who love you.